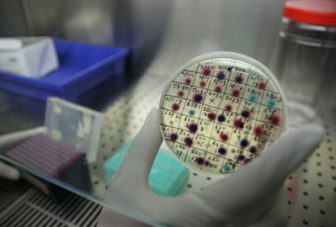 This study will undertake a comprehensive screen for antibiotic resistance genes (ARGs) carried by bacteriophages in waste water, using targeted genomics approaches where an antibiotic sensitive E. coli reference strain will be exposed to bacteriophages isolated from waste water, followed by screening of clones for antibiotic resistance and next generation sequencing. A variety of genetic mechanisms are responsible for the rapid spread of selectively advantageous ARGs across different bacterial taxa. Recently, it has emerged that transduction, the occasional packaging and transfer of host DNA by bacteriophages, is a potentially very important mechanism of ARG spread. Antibiotic resistance genes are ubiquitous in the natural environment, especially in human impacted environments, and contact between human and animal-associated bacteria and environmental bacteria is likely to speed up horizontal transfer of ARGs between both types. If one would want to design an environment conducive to widespread ARG transduction, it would be a well-mixed, large volume reactor with a high diversity and density of bacteria and phages and concentrations of biocides and antibiotics high enough to select for resistance: a waste water treatment plant. By performing a comprehensive screen for ARGs carried by bacteriophages in waste water for the first time, this study will reveal fundamentally new insights into the molecular evolution of traits highly relevant to human health, and could also lay a foundation for research-led changes in waste management.